What happens to the biz of you during the holidays? It’s so easy to get wrapped up in things (pun intended). Whether you on giving gifts to people or a receiver who loves the joy of the new and unexpected in unwrapping some gift, life seems to slip by and our time, financial, and relationship resources may be impacted. These are the times it’s important to be mindful of our resources. It’s also time to remember gifts are less important than the connections they provide. Our gifts can be simple and impactful if we can tune into the essence of the season and the people we connect with. We can enjoy the giving and receiving if we can simply focus on the fun, exchange and interaction with the spirit around and within us. The ability to give and receive is integral to the biz of you. This interaction is the cornerstone of managing the biz of you. Our interactions are the fuel for the creative fire we harness to create our vision of the future. 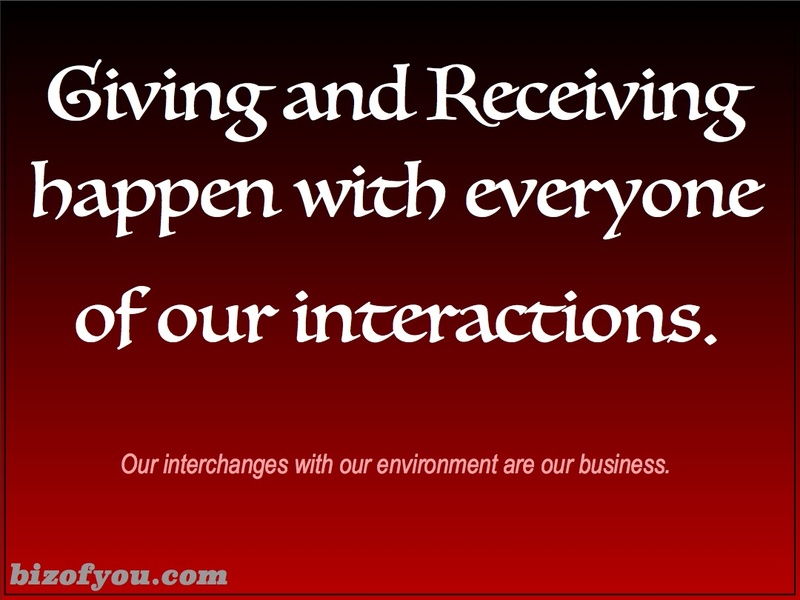 Giving and receiving is the essence and spirit of the biz of you. This is the crux of interaction and nature of our daily existence. From this prospective, Christmas is not limited to one time of the year. Rather it is something we can partake ever day. When we give we receive and vice versa. Managing the business of you is about harnessing the power of our interactions to serve our purposes while simultaneously helping other serve their own purposes. In this light, I wish all of you a Merry Christmas in every one of your interactions. The ability to give and receive is integral to the biz of you.